In continuous publication since 1969, Peace Research: The Canadian Journal of Peace and Conflict Studies is Canada’s oldest and primary scholarly journal in its area. It is published twice a year and is distributed internationally. Peace Research publishes broadly on issues of conflict, violence, poverty, just peace and human well-being. Peace and conflict studies holds peace as a value, and peaceful methods as the most desirable form of conflict transformation. The journal invites Canadian and global scholars to publish cutting edge research and analysis on peace and conflict issues from both disciplinary and interdisciplinary perspectives. PACS-Can is proud to work with Peace Research. As part of our partnership, we offer our members an annual subscription to the electronic version of the journal at a reduced rate. Learn more about our different membership levels here. Volume 50, Number 1 (2018) is now available online to Peace Research subscribers. 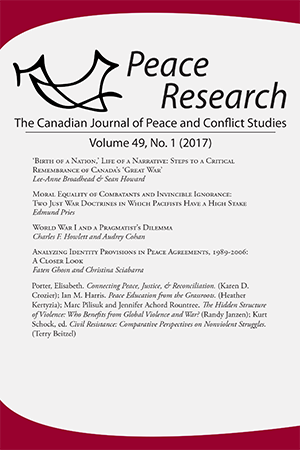 For its 49th volume, Peace Research: The Canadian Journal of Peace and Conflict Studies published a special double-issue featuring papers presented at the inaugural PACS-Can conference. The conference – under the broader theme of “Emerging Issues of Peace and Conflict Studies in Canada” – took place in Winnipeg from 18-20 June 2015, and the special journal issue features eight of the best papers presented at the conference. 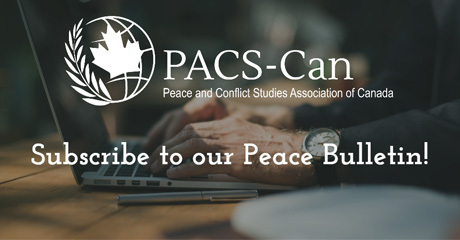 Given the evolving relationship – and common cause – between Peace Research and PACS-Can, we’re pleased to offer here both the introductory essay from the special issue, as well as the table of contents for the full issue below.